My Practical Skills™ Fashion Design Tutorials are designed to provide fashion designers with complete, illustrated step-by-step, fashion training in important apparel design skills and the most commonly used fashion CAD software programs in the apparel industry. 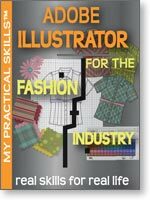 With our easy to follow fashion eBook tutorials, you'll get professional fashion design training from the comfort of your own home and learn at your own pace. From the basics to beyond, you'll learn our personal techniques that will make you a valuable asset to any apparel design company! Learn how to use Adobe Illustrator to draw and render garment sketches, use Adobe Photoshop to create textile designs and presentation boards, use Microsoft Excel to format complete apparel tech packs with spec sheets, detail sheets, and grade sheets, and learn how to measure garment specs. 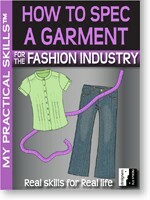 My Practical Skills™ Fashion Design Tutorials gives fashion designers the skills and confidence needed to compete, succeed, and excel in the apparel industry!